From 16 to 18 January 2019, the United Nations Legal Counsel, Mr. Miguel de Serpa Soares, visited The Hague, the Netherlands. The main purpose of this mission was to deliver a lecture on the topic of “Building an international accountability system” at the Hague Academy of International Law. 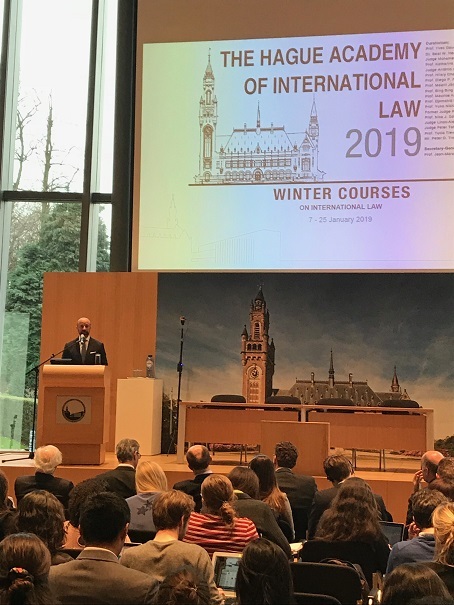 At the invitation of Professor Jean-Marc Thouvenin, the Secretary-General of the Hague Academy, Mr. Serpa Soares addressed students of international law who convened at the Peace Palace in The Hague in the framework of the first winter course that the Academy offered in its long history. Following his lecture, the UN Legal Counsel made himself available for an extensive questions and answers session with the students. He further participated in the traditional lunch in honour of the professors teaching the courses and met for an informal exchange of views with the members of the Curatorium of the Hague Academy. Mr. Serpa Soares thoroughly enjoyed his exchanges of views with the students, renowned professors of international law from all over the world and the members of the Curatorium of the Academy. Mr. Serpa Soares used the opportunity of his presence in the Netherlands to meet with representatives of Hague-based international courts and tribunals. At the Peace Palace, Mr. Serpa Soares was received by Judge Abdulqawi Ahmed Yusuf, the President of the International Court of Justice, and by Judge Xue Hanquin, its Vice-President. At the Special Tribunal for Lebanon (STL), he held an exchange of views with Judge Ivana Hrdlickova, President of the STL, the and at the seat of the International Residual Mechanism for Criminal Tribunals (MICT), Mr. Serpa Soares met with the incoming President, Judge Carmel Agius. On 18 January, Mr. Serpa Soares participated in the formal opening ceremony of the 2019 judicial year at the International Criminal Court. Following the ceremony, Mr. Serpa Soares had a brief exchange with the President of the International Criminal Court, Judge Chile Eboe-Osuji, and meetings with the Prosecutor, Ms. Fatou Bensouda, and the Registrar, Mr. Peter Lewis. From The Hague, Mr. Serpa Soares travelled to Brussels, Belgium, to meet with a European Union delegation to discuss issues relating to the impact of the entry into application of the EU’s General Data Protection Regulation (Regulation (EU) 2016/679) on certain United Nations operations. Mr. Serpa Soares led a delegation composed of representatives of OLA, IAEA, IOM and UNHCR. The EU delegation was led by Mr. Luis Romero Requena, Director-General of the Legal Service of the Commission, and comprised members of his service as well as members of the Directorate-General for Justice and Consumers. The meeting was preceded by informal discussions of this topic with the EU Delegation in New York and exchanges of letters between the UN Legal Counsel and the Head of the EU Delegation in New York. The meeting in Brussels had been scheduled to have a first face-to-face exchange of views and to agree on a process to find an arrangement between the United Nations and the European Union regarding the impact of the General Data Protection Regulation on mandated activities of United Nations System Organizations, in particular in Europe. The meeting was held in a cordial and constructive atmosphere and resulted in both delegations agreeing on a process to facilitate the finding of an arrangement.